Just after abit of advice on swapping over an esl board on a JDM ecu to my uk ecu. I know I could swap is it crank sensor connection over. But prefer it on original Ecu. 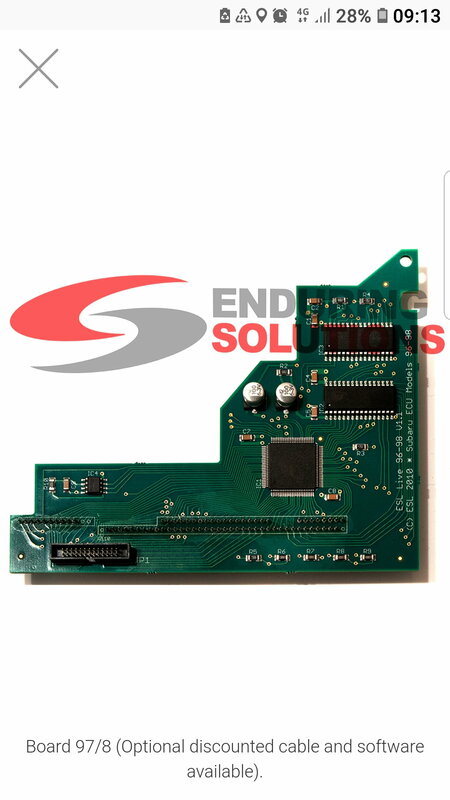 So reverse the process to remove the board and set the JDM ecu back to standard, then follow the instructions to install the board on your UK ecu. I wouldn't bother myself if its in the JDM ecu now and working just swap the pins over and fire it up rather than risk damaging either ECU or the ESL board itself. Ok cheers I did think about that. Will need it sending off to reset ecu to standard. Picture below of board. I think that's the old ESL board the v1.1 - pretty sure the current ones are v2.0 now so may not be worth re-using it as the software is tricky to get working and it's not as flexible as the new 2.0 board. That board isnt even mappable, only the v1.1a was back i the day. It's the latest board,the only one for the v3/4 car. Last edited by ossett2k2; 03 October 2018 at 09:31 PM. Did it come with motorsport pack jay? Cheers for info Rich thought there was only one board for the v3,v4. Not sure about motorsport pack, guessing its just software and no visual evidence. if you've got the data cable you will be able to reset it back to the OE map to save you sending it off,all you'll need is a copy of the 8s rom. Will ask Andy how much, just what 2 maps for now standard and Prodrive. Then will get it mapped. will do some searches, think someone on here had a cable up for grabs. Guessing if I did that it wouldn't get rid of motor sport pack not that I think it's on there? Guy I bought it off said it came of his Terzo so guessing that will be straight swap no need for swapping ecu connections around. I've got the 1.2 v3/4 board in mine and been told it's pretty much had it in that the software to map isn't there so they would need to resurrect it. You sure bud as ESL website doesn't mention v2? Nice one,no need to swap pins from uk terzo. No you wouldn't lose motorsport. It's the v1.1 and the only version for 97/98 afaik,I run it and map mine,the software is nice to use. From esl website,same board I use. Have you got a cable with yours? Software is rediliy available and works fine for me. Z4 ecu with poss esl board! !